Did you know that you might be able to attend one of the country’s best colleges for free…? Or receive four years of funding to attend Rowan University…? Or get full tuition to your home county college…? And these are just a few of the incredible resources that are available to New Jersey residents! Finding financial aid for college can be difficult – and as a New Jersey resident finding all the financial aid available to you can be even more challenging. But don’t get overwhelmed, we’re here to help. We’re going to take you through all the resources available to New Jersey students. Before we get to New Jersey-specific funding opportunities, it’s important to understand the federal funding available. The first thing you should do when considering how to finance college is fill out the FAFSA (also known as the Free Application for Federal Student Aid). The Federal Student Aid office, which is in charge of the FAFSA, gives over $150 billion to students like you to pay for higher education. You can apply for the FAFSA even before you apply for college—and in fact you should so that you can be considered for state and institutional aid and scholarships/grants that might apply to you. Unfortunately, the FAFSA is notorious for its length and for its complex questions. Luckily for you, we’ve got a step-by-step guide to completing the FAFSA questions that will help you get through the FAFSA without frustration. In addition to federal funding, you should also explore and apply for state funding and scholarships for the state of New Jersey. The Higher Education Student Assistance Authority (HESAA) is a first resource for New Jersey residents to look at when trying to obtain financial aid. This is the agency that administers New Jersey state grants and scholarships. The HESAA also provides a extremely useful, comprehensive brochure that guides you through state and federal financial aid opportunities for NJ students. Veterans Educational Assistance Program – a program that offers financial support to those who are or were active-duty in the military, as well as to their family members in some cases. There are also many grants that are offered to New Jersey residents. New Jersey Tuition Aid Grant (TAG) – gives undergraduate students financial aid up to the full cost of tuition based on financial need, tuition, and available funds. New Jersey Educational Opportunity Fund – provides financial assistance to students who come from economically and educationally disadvantaged backgrounds. NJ-GIVS – a program for women and minorities to receive up to $2,000 or the cost of tuition to a technical or county college to work in specific industries or careers. Another resource for scholarships is through the school that you are accepted into. Many schools offer scholarships to students and some can even be given yearly all four years of your undergraduate career. For example, Rowan University has scholarships specifically for incoming students. The Rowan University Scholars Program is a merit-based program that awards financial aid every year for four years. Similarly, the Transfer Trustee Scholarship awards $5,000 to transfer students coming from local community colleges with a GPA of 3.5 or higher. Additionally, Rowan University provides Micro-Scholarships for students with outstanding high school achievements. By adding these achievements to your online profile, you could earn scholarship money for leadership opportunity, excellent grades, and other academic and extracurricular accomplishments you had in high school. For high-achieving high school students, Princeton University is committed to making college “affordable for all.” All students who come from a family that makes under $180,000 will be awarded some financial aid and full tuition is covered for students that come from a family that makes under $65,000. Furthermore, Princeton offers job opportunities for students to help cover part of the rest of the cost of tuition. These are just two schools in New Jersey, but make no mistake that many other schools have financial aid opportunities that you should look into. Once you’ve applied for the FAFSA as well as federal, state, and local scholarships and grants, you may find that you still don’t have enough to cover the cost of college. If so, you might want to consider applying for a private loan. Picking the right loan is very important to ensure that you aren’t paying more than you need to finance your education. 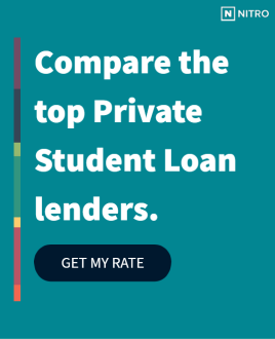 We have a list of the best banks for private student loans to help you find the best rates available. And in order to have a better idea of what your financial situation will be, we’ve created the NitroScore tool to help estimate the cost of college based on funds you are receiving (including savings, grants, and scholarships) as well as your major and school. NitroScore can give you a good idea of what sort of costs you will have after college and approximately how long it will take you to pay off your loans. We know how important it is to be able to afford college. And now that you have the right tools, you can be confident that you are ready to finance your future!